This harness is plug and play; no splicing involved. It is extremely easy to install. Besides the physical aspect, it simplifies the PCM side of the swap. There is no segment swap (GenIII) or fancy programming needed (GenIII and IV). Converts any 4L60e, 4L65e, or 4L70e to 4l80e, car or truck, even 97-98 LS1's! For 06-later vehicles with separate trans controllers, an 80 swap can be particularly difficult with the older style harness. With the removal of a code or two from the TCM, that's all you need to get the ball rolling. It retains cruise control and OEM shift indicators. 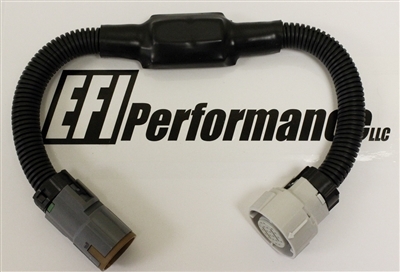 This cable retains FULL LOCKUP at lockup speeds, even at zero throttle. End the annoying cycling of your converter if you originally did it the other way. Made in the USA by PCMofNC!